Budget-conscious consumers often turn to lesser-known manufacturers for products that offer a lot of value at a very affordable price. Sometimes they find a real bargain and the relatively low price offsets whatever drawbacks the product may have. That's just what they may find with the TRENDnet TN-200 2-Bay NAS Media Server. The TN-200 comes in two models, the diskless model that is our review sample (~$100) and the TN-200T1 with a single 1 TB drive (about $190). As with all two bay NASes, the TN-200 supports RAID 0, RAID 1, (mirroring), individual volumes per disk and JBOD (Just a Bunch of Disks). As you can see from the image above, the TN-200 has a white plastic case. The majority of the front panel has a molded-in grill that provides front to back airflow for cooling. Unlike many NASes that mount the drives horizontally through the front panel, the TN-200 has a slide-off top that allows you to mount the drives vertically. You just line up the power/data connectors on your eSATA disk with the corresponding connectors on the TN-200's PCB and gently slide the disk into place. You'll feel it seat in the connector, and you'll know that it's in the right location when the screw holes in the mounting bracket line up with the mounting holes on the disk. You secure each disk with two screws - one in the front and one in the rear bracket. In the image below, I didn't screw in the drive to the right hand bracket so you can see how the screw holes line up. The front panel of the TN-200 is fairly simple. There's a power button an indicator for each disk, and a USB sync button. The chart below summarizes each indicator. The image below shows the rear panel of the TN-200. Directly above the Ethernet port, there's a Kensington lock slot. Above the fan grill, you'll find a slide lock that locks the top cover in place. The Ethernet port has two built-in indicators for link and activity. The TN-200 is powered by a Marvell "Kirkwood" 88F62702 running at 1 GHz. Other key components are found in Table 1, with summaries for three other sub-$150 NASes. Note the TN-200 uses the same amount of memory as two of the other devices and has the same processor as the D-Link DNS320L. The TN-200 drew 14 Watts with two WD RED WD30EFRX 3 TB (SNB provided) drives spun up and 7 W when the drive spun down after the programmed idle drive time. The TN-200 relies on a fan for cooling. By default, the fan is set for "Auto Speed", which lets it spin up to a higher speed after a period of heavy I/O activity. When the fan is spinning faster, I'd rate the NAS as moderately loud, and the fan only adds to the noise made by the drives. Even with the disks spun down and the device in "hibernate" mode, the fan is still running, so you'll hear the constant hum in a quite office. I guess that I've gotten spoiled by the quietness of the other NASes that live on a shelf near my desk. For those of you who like the circuit board image, the photo below shows the component side of the PCB. The Marvell SoC is located right in the center of the board. The TN-200 shares an almost identical feature set with the D-Link DNS320L. The list below is compiled from the User Manual (which ships on an included CD), TRENDnet's online specifications and the DNS-320L's feature list. MTP (Media Transfer Protocol) from MTP compatible USB devices such as digital cameras and smartphones. 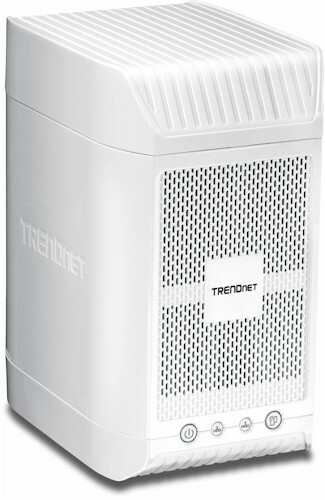 The TRENDnet TN-200 has an easy-to-navigate user interface. The home page, shown below, has four top level choices: Management Center; File Center; Backup Center; and Download Center. Each of the icons takes you to a corresponding submenu. TRENDnet provides an online emulator, so I won't include too many screen shots. The Management Center is probably the menu that you'll use the most. For each item in the menu arranged vertically on the left, there are additional submenus that you access using the tabs arranged horizontally across the top. In the upper right hand corner, the "?" icon takes you to brief context-sensitive help. To navigate back to the home page, hover your mouse over the ">>" tab located at the left side of the screen. A flyout menu provides navigation options to each of the other management centers as well as the home page. Other NASes from manufacturers such as QNAP, Synology, Western Digital and NETGEAR provide extensive remote access features - often through dedicated apps for both Android and iOS. The TN-200, in contrast, doesn't support much in the way of remote access other than simple FTP or WebDAV. If you want to remotely access the TN-200, page 28 of the User's Guide provides instructions. But you'll need to feel comfortable setting up a port forwarding rule on your router. If you want to preview the User's Guide, you can download it from the TN-200's support page. My initial setup ran into a slight hiccup, but the problem was caused by using disks that contained data from another NAS. On the initial boot, both of the drive lights turned red, indicating drive failure. I logged into the management page and changed the default "Normal" drive setting to RAID1 and allowed the TN-200 to reformat both drives. Thereafter, the device booted without a problem. DLNA/iTunes - I loaded the TN-200 with my standard group of test media files. I tested the server using my standard WDTV Live media streamer. Videos, music and photos all played back as expected. Some NASes I've tested have had problems playing photos. They also stream thumbnails that the NAS has generated, and those, as expected, pixelate when displayed full screen. I'm happy to report that the TN-200 NAS didn't have that problem and played only high resolution images. The iTunes server also worked as expected. It appeared on both the MacOS and Windows versions of iTunes. I did have one small issue that I've seen on other NASes in the past including the WD My Cloud, i.e. the iTunes server dropped offline once. I just restarted the server from within the UI and that solved the problem. The image below shows iTunes on my Mac playing back music from the TN-200's iTunes server. Time Machine - I also tested the Time Machine backup feature. You have to enable Time Machine under the Backup Center in the Local Settings page and select a share. But I ran into a problem that I've also seen on other NASes. Initially, I couldn't get the volume to mount within the Time Machine preferences dialog box. It rejected my user name/password. I worked around this by doing an AFP mount from the Connect to Server (Apple K) using the format afp://ip_address. As soon as I entered the credentials, the volume was mounted and I was able to use the TN-200's share for Time Machine backup. System Notification - The TN200 has fairly good notification features. You can be notified via email and select the events for notification. You can also email the internal syslog when it gets full or on a scheduled basis. Alternatively, if you have a Syslog server, you can log events from your TN-200 directly to your Syslog server. I set up the TN-200 for email notifications to see how it would work when I performed our standard "Drive Pull" test. The screenshot below shows a partial list of event triggers. Event triggers not shown due to screen scrolling include Send Log file (Either when it's full or on a scheduled basis); Oce torrent download is done; Send S.M.A.R.T. Test Result; and Recovering from a power failure. Triggers that I'd also like to see would include notification of FTP connections as well as FTP uploads/downloads. Status - The TN-200 has a decent status menu. The Status->Device menu shows CPU utilization, RAM utilization and current device temperature. Check the TN-200 emulator for more screens. I initially configured the TN-200 as a RAID 1 device - ie, data mirrored on both drives. As we often do, I performed a drive pull test to see how the TN-200 reacted to a simulated drive failure. To run the test, I started to copy a number of directories to a share on the TN-200. While the file copy was in progress, I pulled the right hand drive. To my surprise, the file copy stopped and my Windows 7 computer temporarily lost its connection to the mapped drive. I clicked on the mapped drive a few seconds later, and the drive connection was re-established. The file copy did not resume - only part of the files were copied, but no data was lost. With many redundant RAID configurations on other brands, the drive copy is not interrupted, so I was surprised when that happened on this test. E-mail notification notified me of the drive removal, and of the volume running in a degraded condition. I shut down the device and re-inserted the drive (the TN-200 does not support drive hot-swapping). An email notified me that the volume was rebuilding and later that "Volume_1 Has Been Rebuilt". The total rebuild time for the pair of 400 GB disks was 1 hour 44 minutes. I was a bit disappointed about the visual indicators on the device. When I pulled the drive, the associated drive indicator light went out. The remaining light remained illuminated green. There was no visual indication that the RAID 1 array was running in a degraded condition other than there only being a single drive light illuminated. When I logged into the Management Center, there wasn't a home page notification about the array running in a degraded condition. During the RAID rebuild, the only visual indication provided was the two HD indicator lights flashing on/off simultaneously. Since the LEDs used for the front panel indicators are multi-colored, I think that TRENDnet missed an opportunity to use Red to flag the degraded array condition. You can find the status of your RAID rebuild in the Management Center under Status->Disk.